By Craig | December 19, 2018 | This post may contain affiliate links, which means we may receive a small commission, at no cost to you, if you make a purchase through a link. Read our Disclosure. 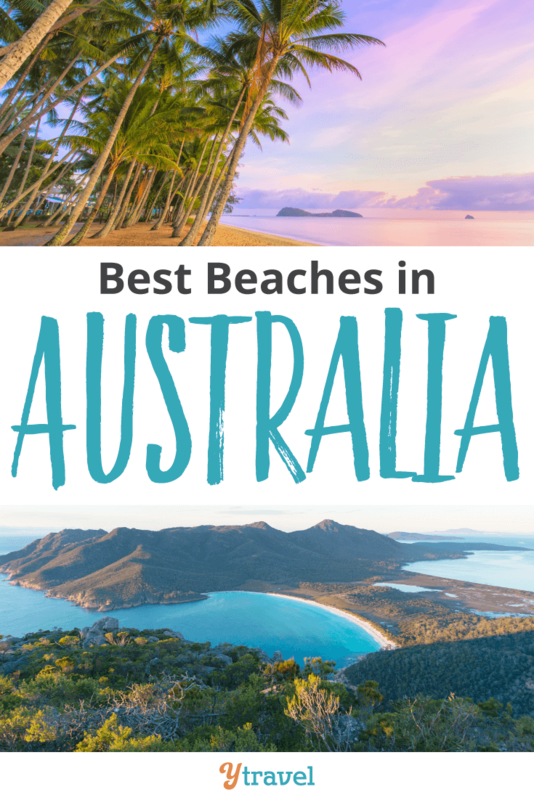 Thought I’d start off the new year by sharing what we feel are the best beaches in Australia to get you inspired for your own trip Down Under. It’s the middle of summer in Oz after all and Australia is all about the beaches. Sure we have the Outback, cosmopolitan cities and charming country towns, but it’s the beach lifestyle that sets us apart. It’s the smell and taste of salt water. The sun’s rays on your back. The sand between your toes. The smell of sunscreen being applied to your face. The cool breeze that blows on a hot day. Beach side BBQ’s and picnics on the grass. Reading a book or listening to tunes. Thongs (flip flops) board shorts and a singlet. A towel over the shoulder. A morning walk or a sunset drink. Building sandcastles with the kids. Body surfing and beach cricket. Smiling faces and tanned skin. In case you didn’t know, Australia’s coastline stretches for 50,000 kilometres and is linked by over 10,000 beaches. That’s a lot of beaches in Australia. Whilst I have barely put a dent in that number, after traveling around Australia for the past 15 months I think I’ve set foot on many of Australia’s best beaches. So it got me thinking what beaches I would recommend if you were visiting Australia? To be honest this list could be HUGE and it’s difficult to narrow down. I haven’t visited South Australia yet and still have the bottom half of Western Australia to go (they will be added later). But, if I had to suggest my favourite beaches in Australia so far that I have personally visited, here they are state by state. No words needed. I mean, just look at that scene below. And no it’s not the Great Barrier Reef. 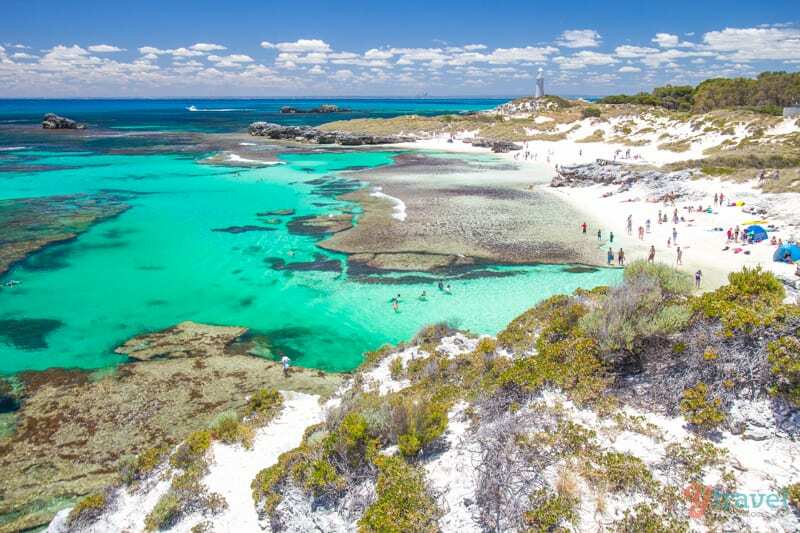 Rottnest Island is located 18 kilometres off the coast of Perth, and if you only visit one beach on “Rotto” make it THE BASIN. 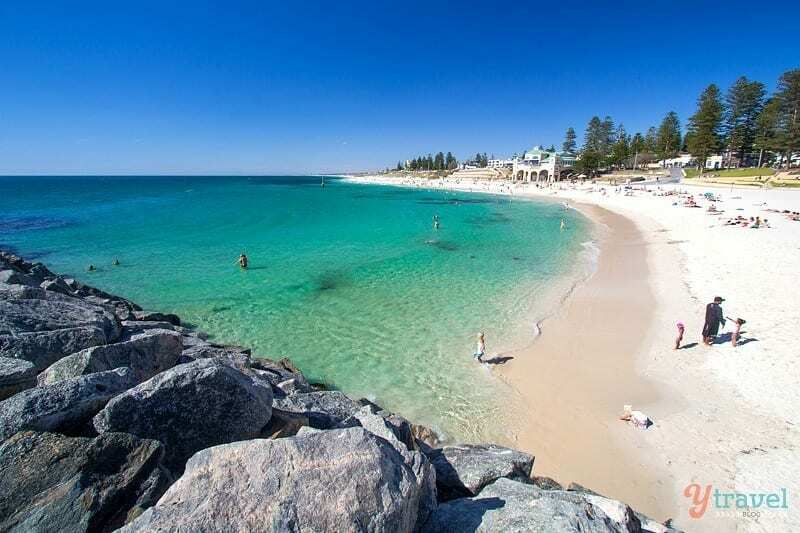 As far as city beaches go, Cottesloe Beach in Perth is a good one. Great place to have an early morning swim, or later on grab some fish & chips and a bottle of wine and take in the sunset. Very popular with locals, parking can be horrendous, but on a sunny day it’s a top spot to be! Another stunning beach on Rottnest Island. Pinky beach is easily accessible from the main town on Rotto and Bathurst Lighthouse makes for a lovely backdrop. 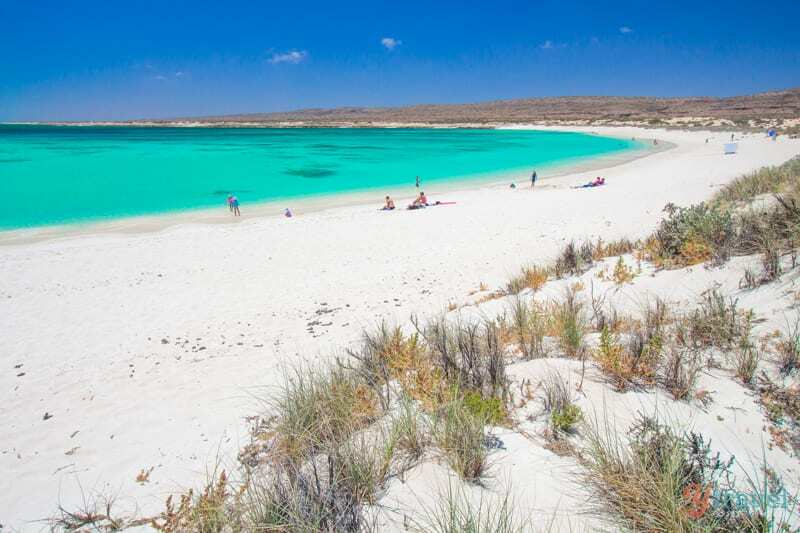 Coral Bay is one of WA’s favourite holiday spots and now I know why. Grab your snorkeling gear, step off the beach and immerse yourself in the natural beauty just metres from shore. 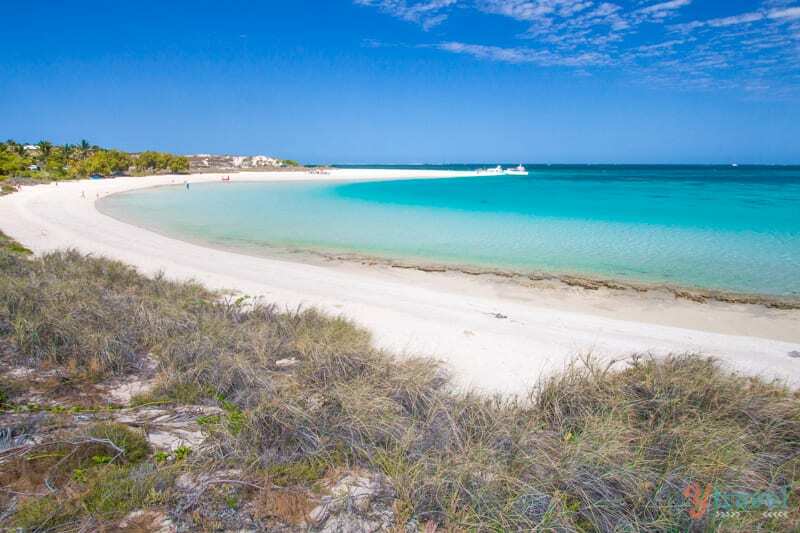 It’s part of the Ningaloo Reef region, and the town is pretty laid back too! This beach is pure paradise. Endless white sand, crystal clear water, dark blue skies. The shallow waters make it an excellent beach for kids. Also located within Ningaloo Marine Park. 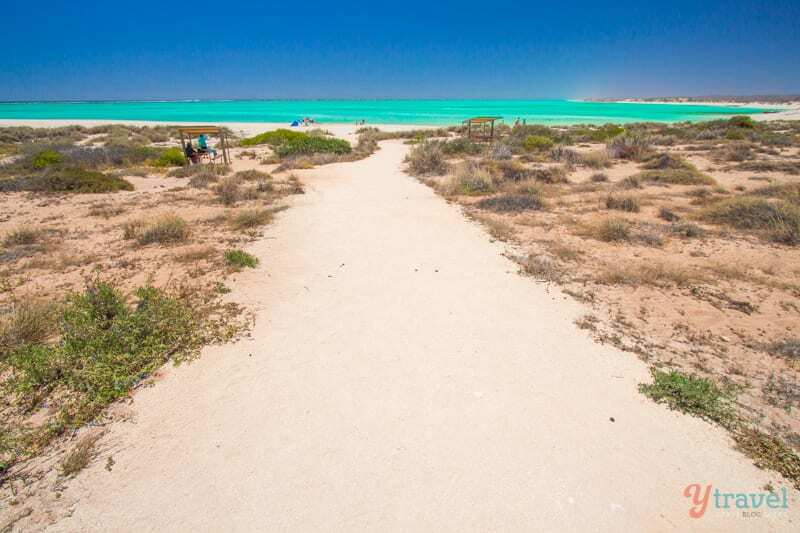 Dive into the waters of Turquoise Bay and your swimming within metres of famous Ningaloo Reef. Torquoise Bay in the Cape Range National Park is brilliant beach for swimming, snorkeling or just relaxing. Try your hand at the popular drift snorkel on the southern end of the beach, then letting the current wash you north. 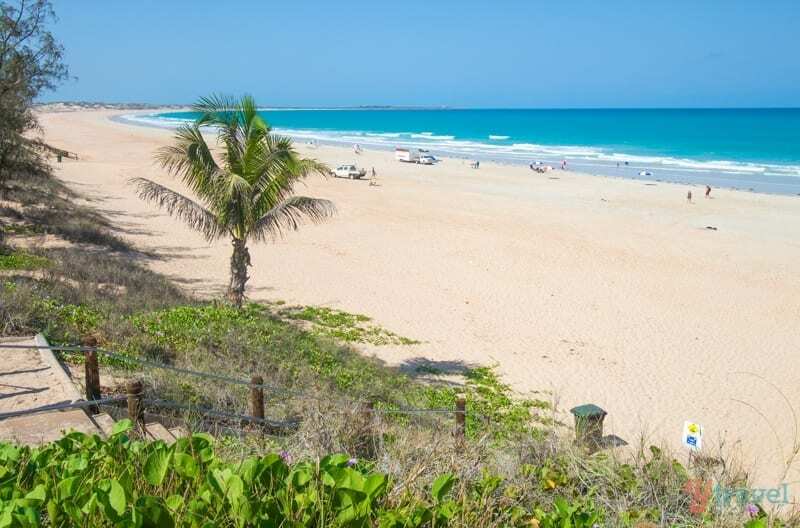 Cable Beach regularly ranks as one of the top 5 best beaches in Australia. No arguments from me! Long, flat, picturesque and perfect for beach cricket and the legendary sunset camel rides. Go ride a camel or sip on a cocktail and watch the sun go down. Not a great beach for swimming or walking or much else. But I simply loved sitting here of a morning at the cafe whilst the kids played in the playground. I mean, look at the VIEW!! And this is the location for the famous “staircase to the moon”. 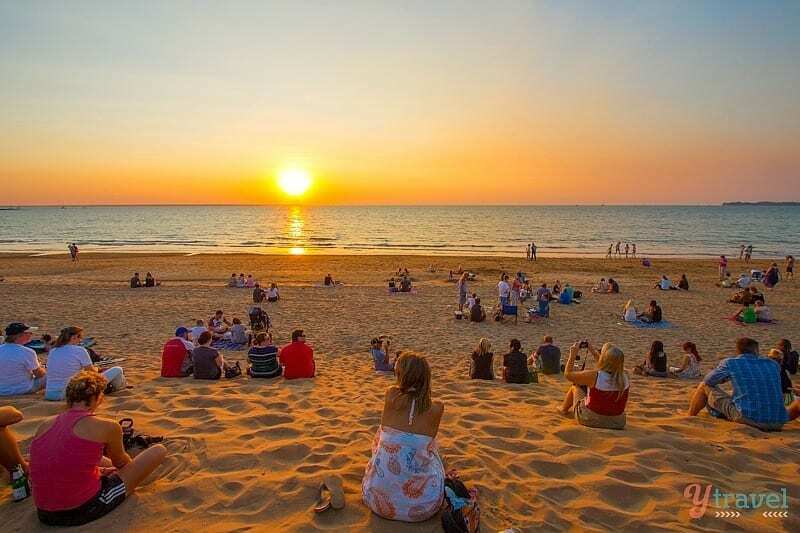 One of the best places in Darwin to see the sunset, as you can see from the amount of people sitting on the beach. Not a place for swimming due to crocs, but the Mindil Beach markets are also legendary so when in town, don’t miss this spot. It’s one of the best beaches in Australia for sunsets. 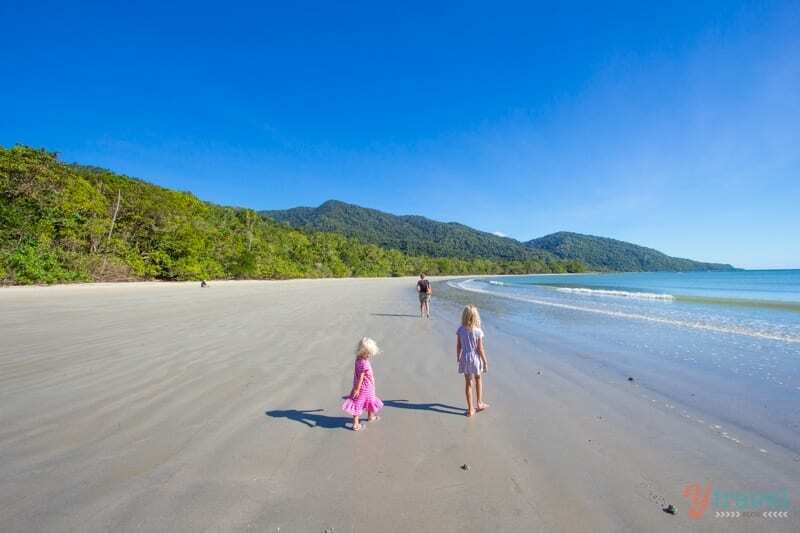 When you have two World Heritage places smack bang against each other (Daintree Rainforest and The Great Barrier Reef) you know it’s going to be something special. Take a walk or go kayaking in paradise! 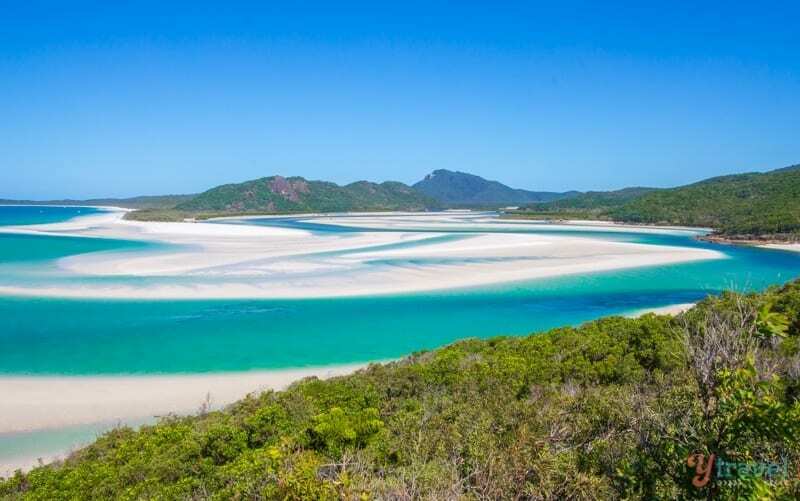 Whitehaven Beach is probably my favourite beach in Oz, and has been ranked 3rd BEST beach in the world on Trip Advisor. It shot to fame when Oprah Winfrey dug her toes into the pure white silica sand on her trip down under. The view from Hill Inlet of the swirling patterns of turquoise water and white sand is picture postcard perfect. 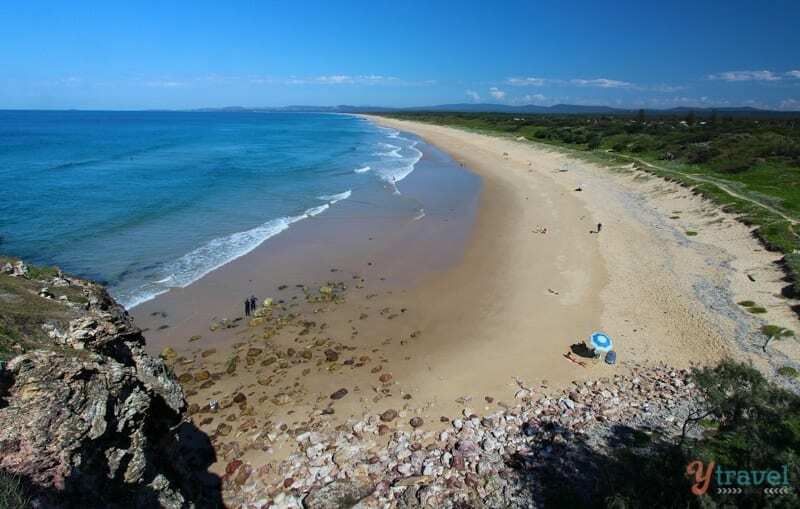 The tiny laid back beach town of Agnes Water is next door to the super laid back Town of 1770. Loved this beach surrounded by nature with gentle waves for the kids and pretty sunsets at night – yep on the east coast! 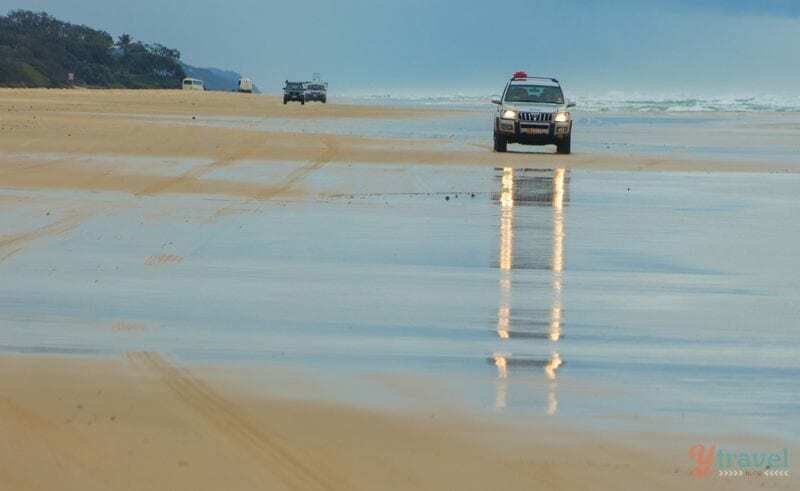 Had so much fun four wheel driving on 75 Mile Beach, located on famous Fraser Island, the largest sand island in the world. 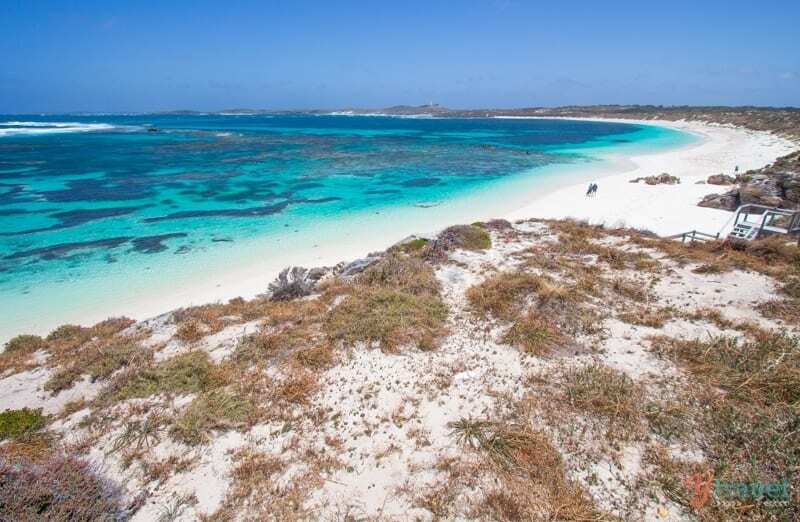 It’s wild and rugged, apparently good beach fishing, and you’ll see wild dingos roaming AND a shipwreck. There’s no doubt about it. 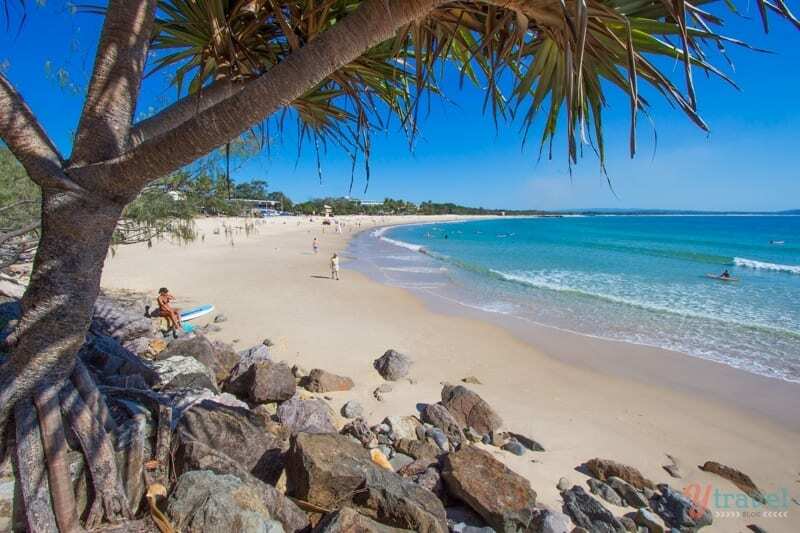 There’s a reason thousands flock to Noosa each year to surf, swim or walk along Main Beach. Another family friendly beach and on a sunny day it’s one of the best places to be on the Sunshine Coast. We lived in Mooloolaba for 18 months and fell in love with this beach. 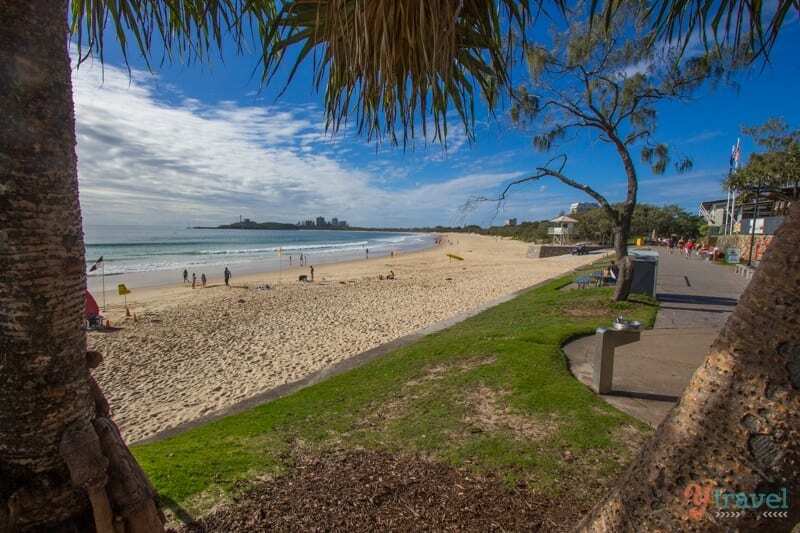 As a beach town, Mooloolaba is hard to beat with great swimming, cafes, restaurants, parks, BBQ areas, playgrounds, and one of the best beach-side promenade walks anywhere. We also lived in Burleigh Heads for 18 months and early morning sunrise at Burleigh Point watching the surfers ride the waves was one of my favourite moments on the Gold Coast. Burleigh has it all like Mooloolaba – great beach, cafes, bars and promenade. 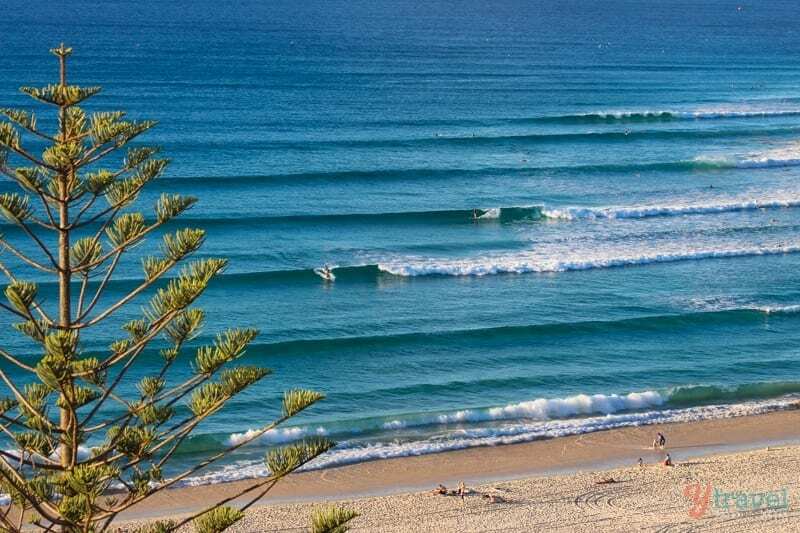 Read More: Best of Burleigh Heads – 8 local finds! Ever since Caz and I got engaged on Coolangatta Beach in 2001 it has been special in our hearts. Everywhere you turn people are out and about surfing, cycling, jogging, doing yoga in the beachside parks, hanging in the cafes and children racing around the playgrounds. Great beach AND town and sunset views over Surfers Paradise! 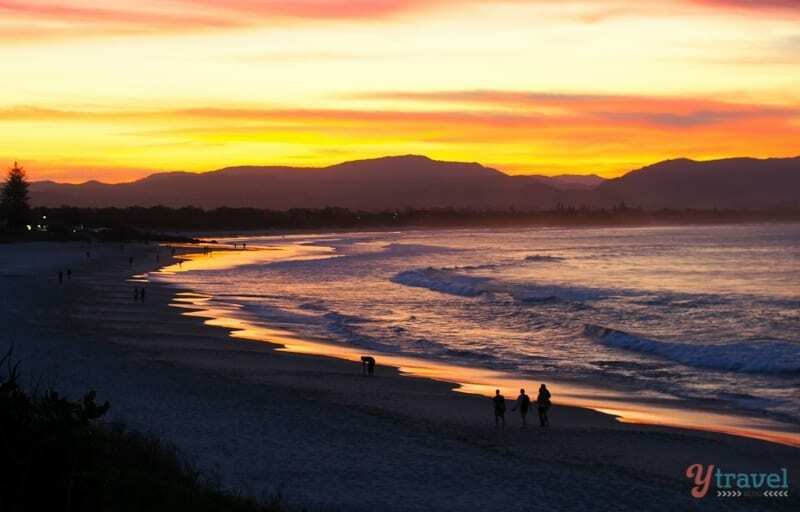 Byron Bay is that legendary beach side town on the NSW North Coast famous for surfing and an alternative lifestyle. 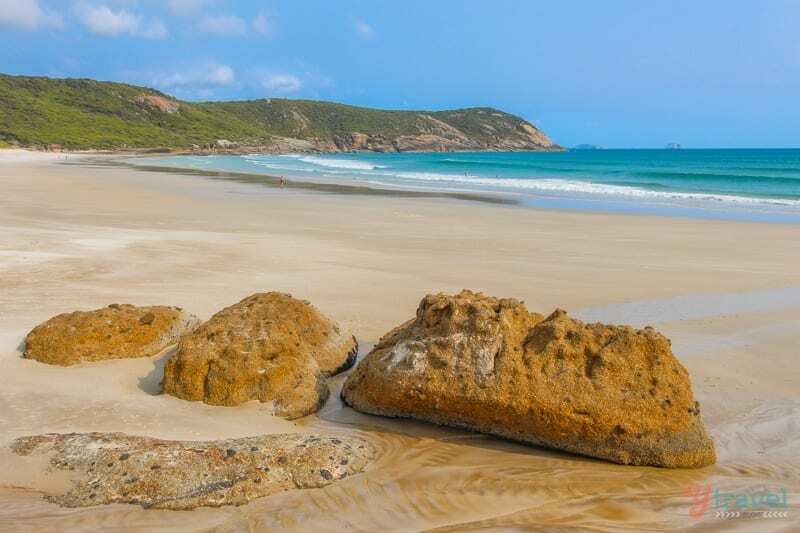 Byron has 5 great beaches to choose from, but it’s Main Beach which sees most of the visitors walking, swimming and enjoying a beach side BBQ. Just around the corner from Byron Bay, is beautiful Wategos Beach. Wategos is protected by the headland making it an awesome beach for swimming AND riding a long-board with the gentle waves. There’s a BBQ area to enjoy or make yourself up a picnic and sit on the beach. We have done the Sydney to Brisbane road trip many times but up until last year had never been to Red Rock Beach. One of those hidden gems tucked away. Beautiful sweeping beach with an impressive headland and red coloured rocks that lead you into to the crystal clear water. 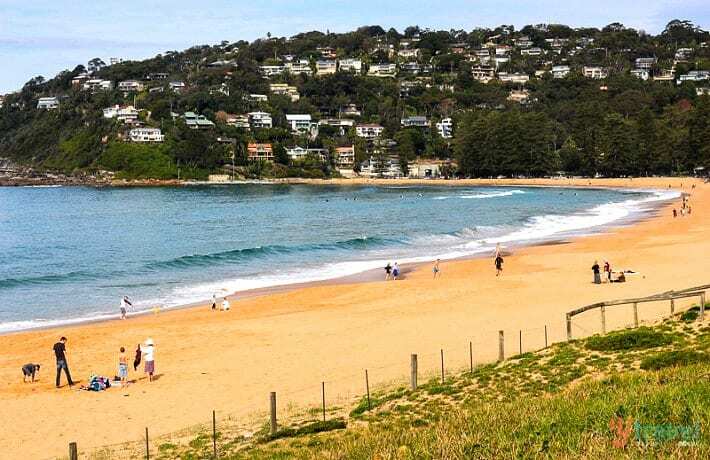 Palm Beach is Sydney’s most northern beach and possibly our favourite beach in Sydney. You don’t have the crowds you get at say Bondi or Manly Beach, and in winter it’s the perfect place to spot migrating humpback whales. 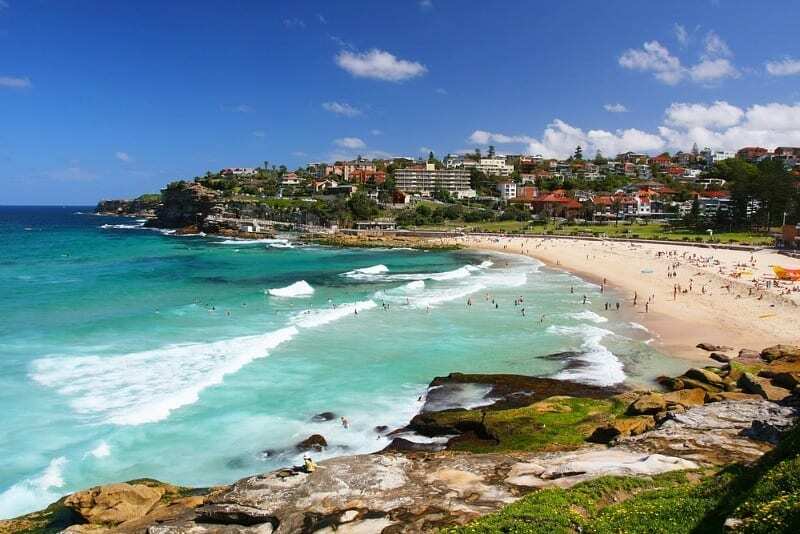 Read more: Is this one of the best beaches in Sydney? There are many great beaches in Sydney, but another fave is BronteBeach. A beautiful beach with a small main street giving it a great vibe. We always stop here when we do the legendary Bondi Beach to Coogee coastal walk. The rock pool is awesome for the kids and the HUGE grass and BBQ area is great for gatherings. I hesitate to put Bondi Beach on any list because it’s not one of my favourite beaches in Australia, but hey it’s Bondi and one of Australia’s most famous beaches – go there at least once. I don’t think you could get any more Australian than learning to surf at Bondi. And the views from Bondi Icebergs as you sip on an afternoon beer are spectacular. 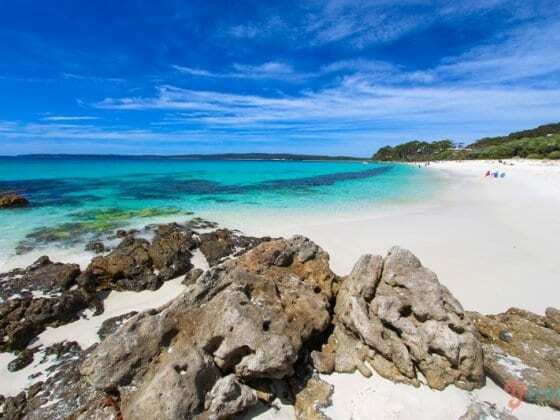 Hyams Beach is in the Guinness Book of Records for having the whitest sand in the world. It’s fine, soft and WHITE. 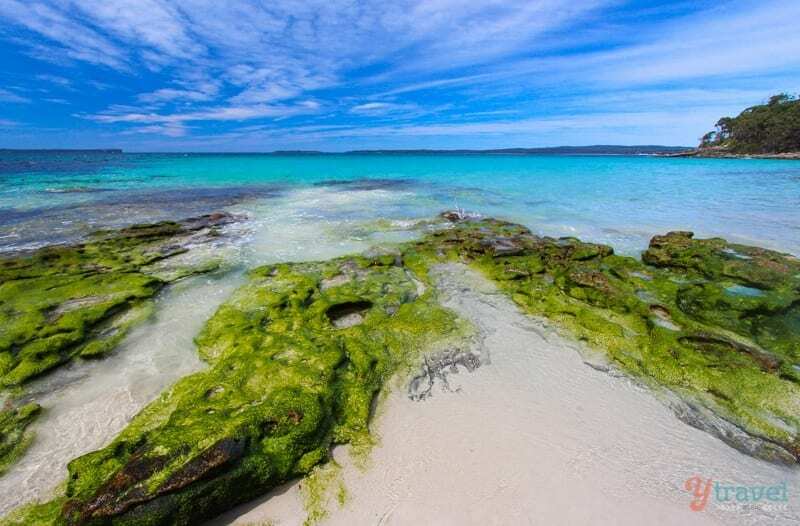 Located in the Jervis Bay region just 180km south of Sydney, it’s a great family beach and doesn’t have the highrise development like many north coast beaches. When I first set eyes on Green Patch Beach I was blown away and felt it just as spectacular as Hyams in nearby Jervis Bay. The water was clean and clear and the sand soft and beautiful to walk on. We spent two nights camping in the campground right on the beach. 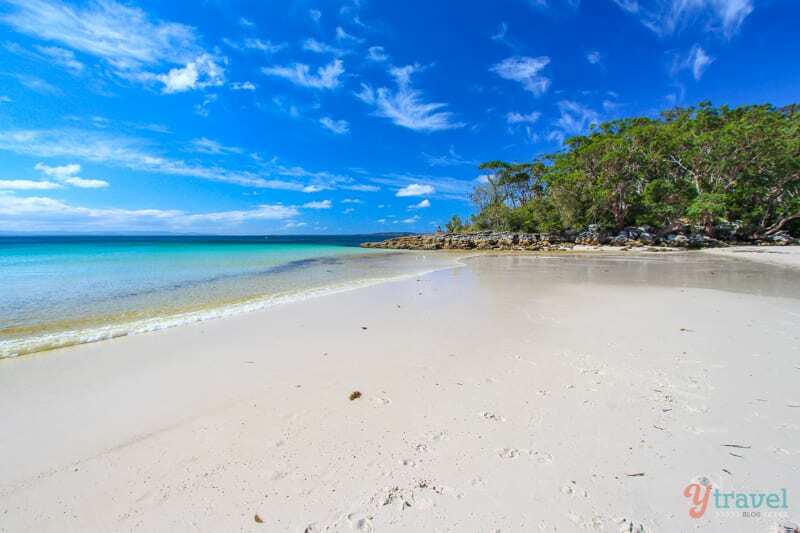 Greenfield Beach is another pristine beach in the Jervis Bay region with that beautiful white powdery sand. Another family friendly beach perfect for swimming with clear aqua water and small waves, and it’s a top spot for a beach side BBQ. 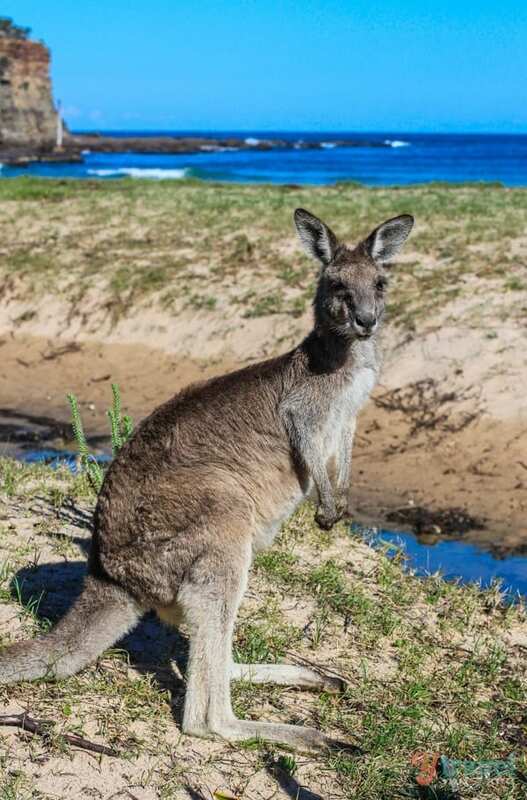 Located in Murramarang National Park on the NSW south coast, Pebbly Beach is most famous as the place to see wild kangaroos hopping around on the sand. They are used to human interaction and there’s a chance you can get up close and personal. Our kids loved it. I’d never heard of Squeaky Beach until last year, but let me tell you it’s all pristine, mind blowing goodness. Located in equally mind blowing Wilsons Promontory National Park, a highlight of our visit to Victoria and one of our best finds! 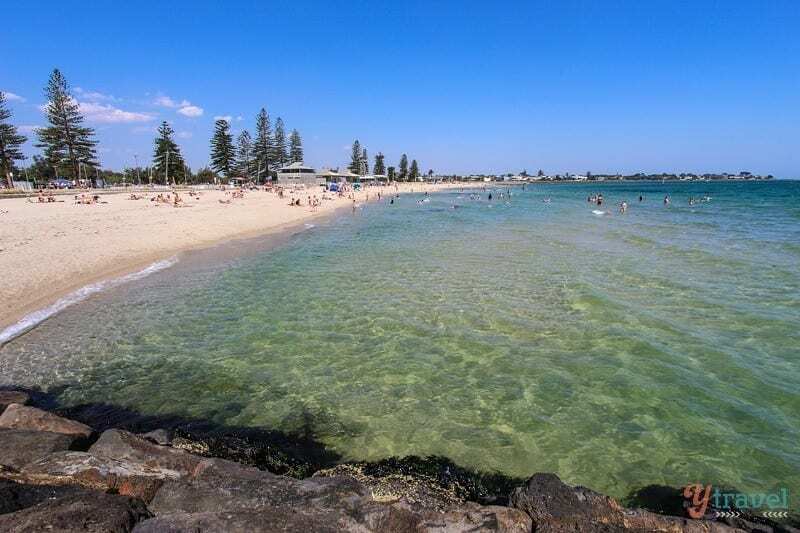 I know, it’s not that great of a beach, but it’s a Melbourne beach and on the tram line and close to the CBD and good for people watching, penguin spotting and cooling off on those scorching summer days. At least go for the sunsets and the AMAZING cake shops! My favourite beach in Melbourne and a popular bayside beach and great for families. Not as accessible from the city as St Kilda (you need a car) but the water was clean and popular for windsurfing, cycling, playing cricket and walking. 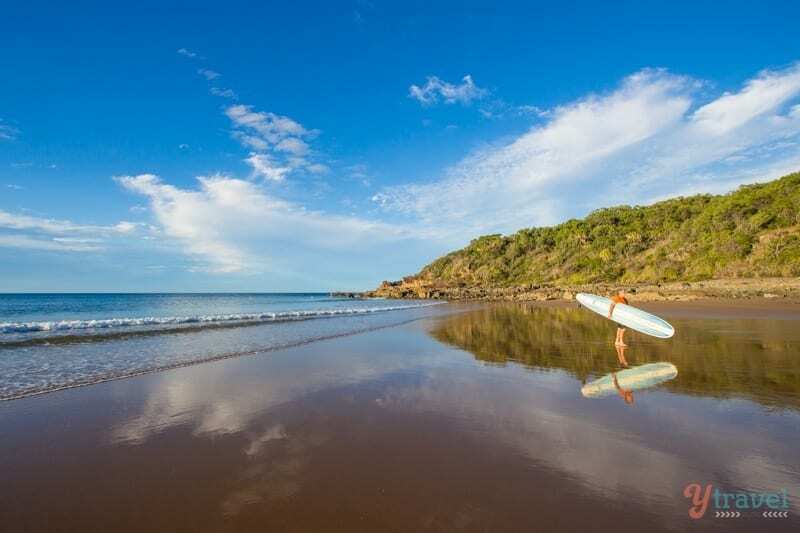 One of Australia’s most famous and best surfing beaches. 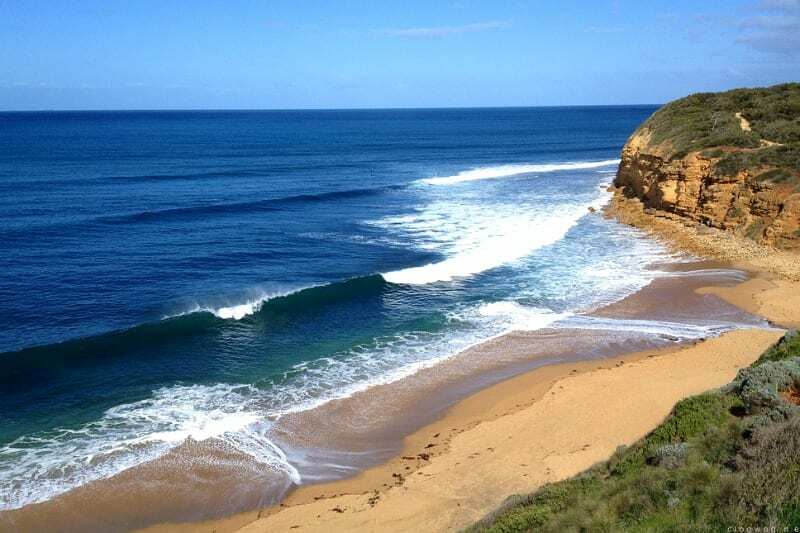 Bells Beach holds the annual Rip Curl Pro Surfing Competition and is the powerful point break of folklore. Heard of the movie Point Break? That’s our Bells! Must visit on the Great Ocean Road. I have no idea if this beach even has a name, but when you drive the Great Ocean Road to go see The 12 Apostles walk down Gibson Steps to get up close and personal with mother nature. Just be careful of the tides so you don’t get trapped. Again, I don’t know if this beach within the Loch Ard Gorge has a name, and the water was COLD and not the safest place for swimming, but it was a highlight of visiting the Great Ocean Road. 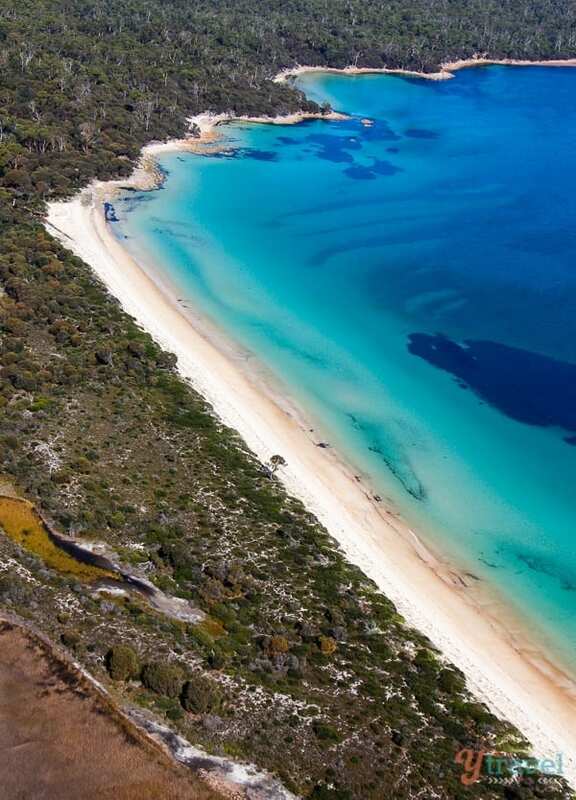 Located in Freycinet National Park (our favourite place in Tassie), we fell in love with Hazards Beach. 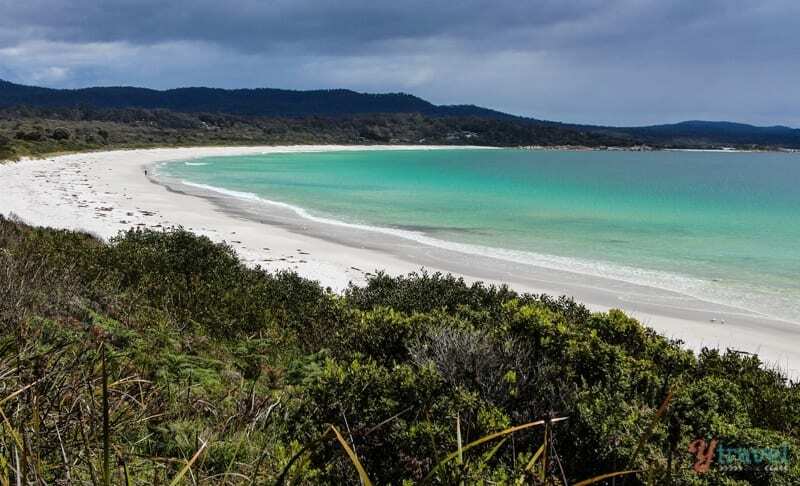 Base yourself in Coles Bay and combine it with the walk to Wine Glass Bay. Or, do it in style and take a sea plane from Hobart. The Bay of Fires is situated on the north east coast of Tasmania, and is a region of white beaches, blue water and these incredible rock formations made of orange-hued granite. 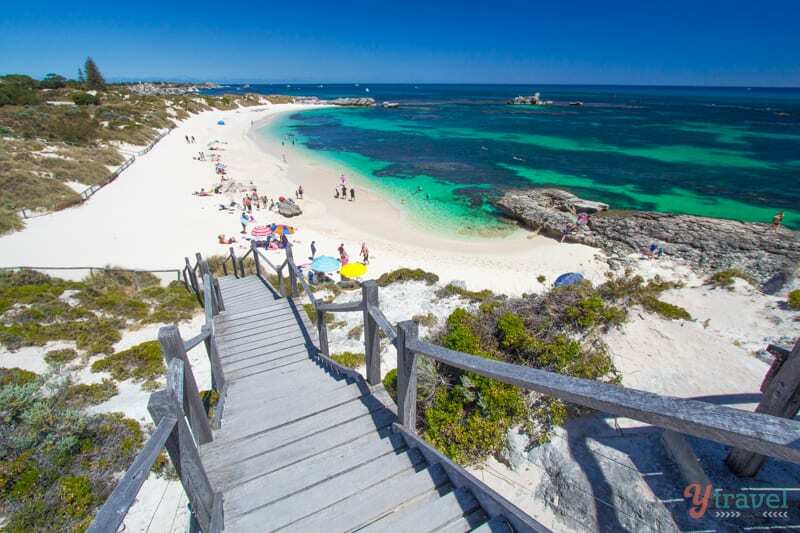 Situated at the southern end of the Bay of Fires (can that place get any better?). Take a walk here then finish off with a great coffee and view from the Binalong Bay Cafe. 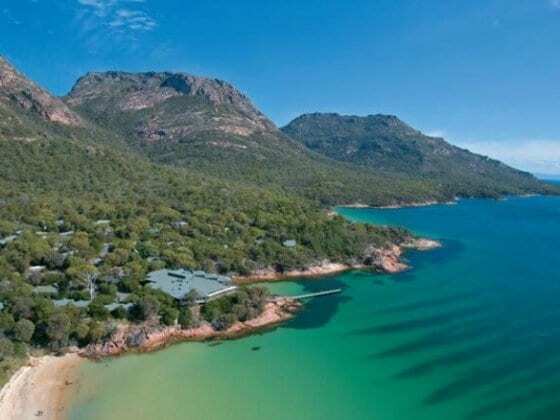 You must visit Freycinet National Park, the home of Wineglass Bay, it’s our favourite place in Tasmania. Make the effort to get up at first light to do the walk and you’ll will find yourself all alone on famous Wine Glass Bay. Imagine having this place to yourself? We did. I wish we spent more time in Bicheno instead of just a lunch break on one of our driving days. Located on the east coast of Tasmania this beach and small town was very inviting and hard to leave. Need more tips for Australia travel? What do you feel is the best beach in Australia? Share in the comments below! South Melbourne is my beach of choice. Definitely not the best but it’s also accessible by public transport. Tram #1, last stop. 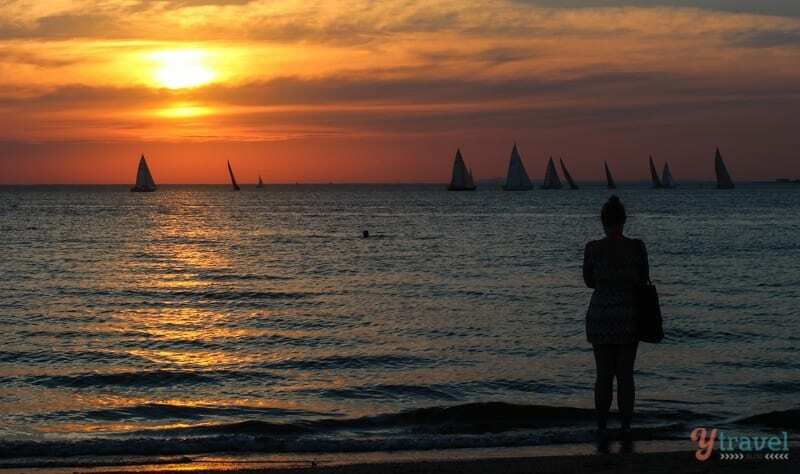 I avoid St. Kilda during the day but will go for the sunsets at night. Didn’t make it to South Melbourne Beach Melissa. But we did enjoy a bottle of wine and takeaway pizza on St Kilda Beach as the sun went down! 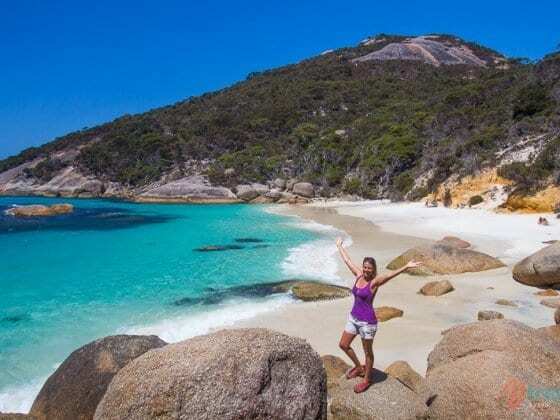 Love that Squeaky Beach made the list! I just actually wrote a post about how much I love Wilson’s Promontory and I love to see it getting the attention it deserves! Squeaky Beach has been one of our better finds in the last 12 months Britt. And Wilsons Prom is amazing. Just wish I had my DSLR with me that day and not taken photos on my phone. Aren’t we just blessed when it comes to beautiful beaches in Australia? Some of my favourites are Boat Harbour Beach and Carlton Park Beach (great for older kids with a long wave perfect for boogie boarding) in Tasmania. 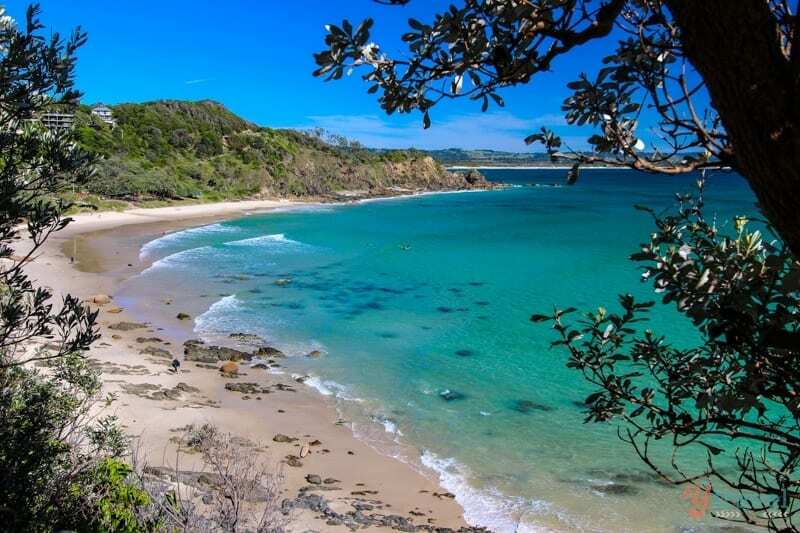 Apollo Bay in Victoria is just delightful and Smiths Beach on Phillip Island is great too. Too many to mention really. Keep enjoying them on your amazing journey. Blessed indeed Amanda. Yep Apollo Bay and Smiths Beach were two other nice beaches we’ve visited. Thanks for the tips on those Tassie beaches! Really looking forward to exploring the beaches around south west Australia Kathy to add to this post later on! Will check out your post now! Incredible list! 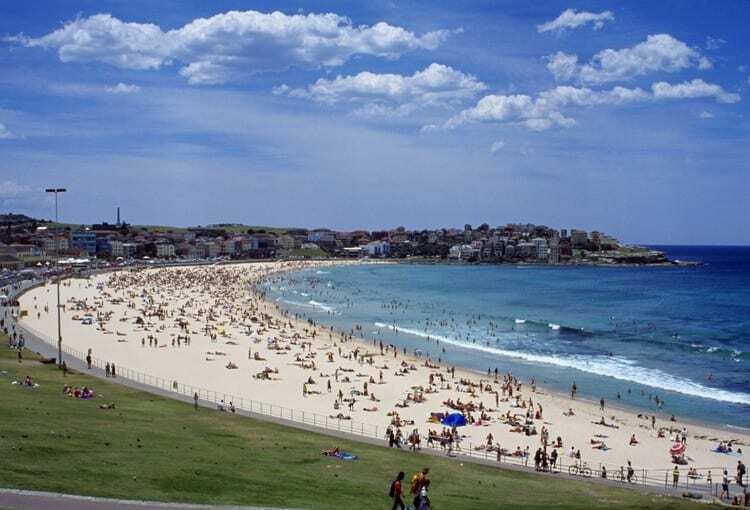 I have been to only Bondi beach in Sydney. I missed that beach at Great Ocean Road. I think this list will help me on my next Australian trip. Thanks so much! Did you even read the beginning of the post? I clearly mention that I haven’t visited South Australia yet! This list is only of beaches I have been to. Once I visit SA I will add my favourite SA beaches after that. Glad you found it useful Amanda! 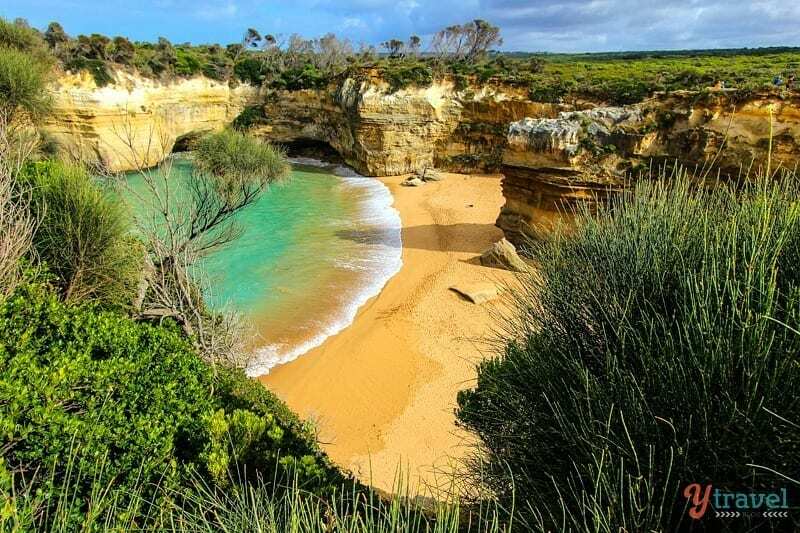 Wow, I want to visit each and every one of these beaches, literally stunning! Come on down under, if you aren’t already, one beach at a time! What an awesome list. Thank you so much for publishing it, Craig! Looks like some of the best beaches in the world. I will keep it for when I will visit Australia 🙂 Which is up on top three on my bucket-list. Was Down in Tassie over the Xmas break, so wonderful to get back Dow there. 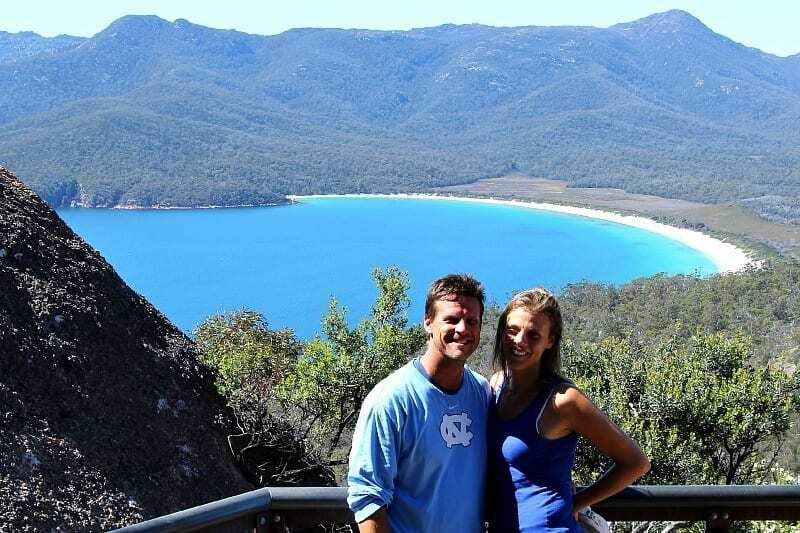 We did the walk at wineglass Bay down do the beach and it was out of this world! Amazing (but very refreshing!) swim once down there. HOLY COW. Australia certainly is not lacking in amazing beaches! Wow. Get me to Rottnest Island, ASAP! That looks incredible! 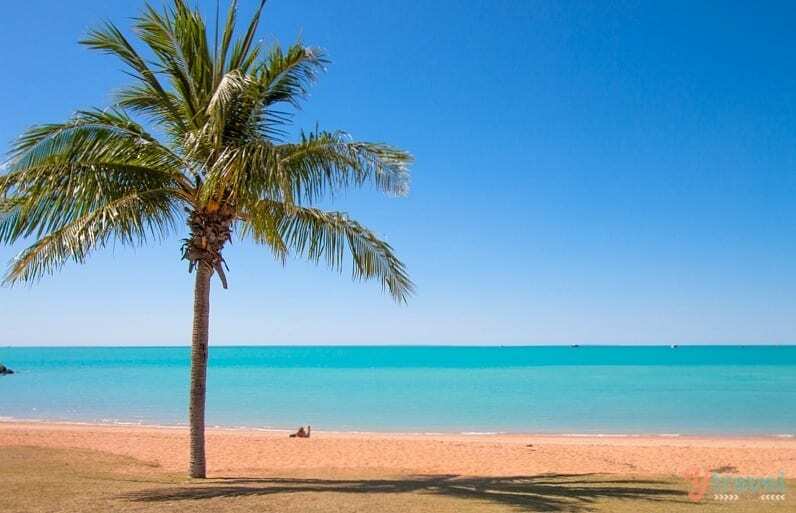 our pick of the crop was Horse Shoe bay in Bowen a must see. We missed that one Casey. Thanks for sharing! great list guys & whilst they are all very beautiful beaches the photographer it’s too bad either. Congrats on capturing them all so well. Can’t wait to see the next list with SA included. Thanks. I’m sure we will be adding a few from South Australia! Have been to 34 out of these 38 Australian beaches! Fabulous photos and colours! Ahhh I have so much work to do! I’ve only been to Gold Cost and Sydney so far, but I think Byron Bay is next on the list for me. Thanks for the list! Byron Bay is a good place to be Hannah! Next time in Vic with have to check out 90 Mile Beach. Thanks. Wow! Some of the beaches in Western Australia look absolutely awesome. We must get over there at some stage. Don’t forget the beautiful north facing Elizabeth Beach (a lovely family beach with an adjacent rainforest walk) and Shelly Beach next door (for those who like a little less clothing) in the quaint little town of Pacific Palms in NSW. We have been to quite a few beaches in our travels but Elizabeth beach is still my favourite. Perhaps it can make it into your top 50. I am not really a beach bum, but you just turned me into one! Your photos are absolutely amazing! you made me so excited about visiting Australia! Thank you, thank you, thank you! Hope you make it to Australia Marta! Very nice list! According to my personal experience, number 4 the Coral Bay, is my favorite! You’ve chosen some beautiful beaches for your list, many I’ve visited on travels. I hope you like our SA beaches. Berry Bay on the Yorke Peninsular is one of my favorites, definitely worth a visit. Port Willunga beach is beautiful local beach too. You guys take beautiful photos. Looking for info on Turkey with young kids and have been looking at so many of your other posts. Keep up the great work! Where are you on your travels now? Obviously South Australia does not have a coastline, as it is the only state to miss out! 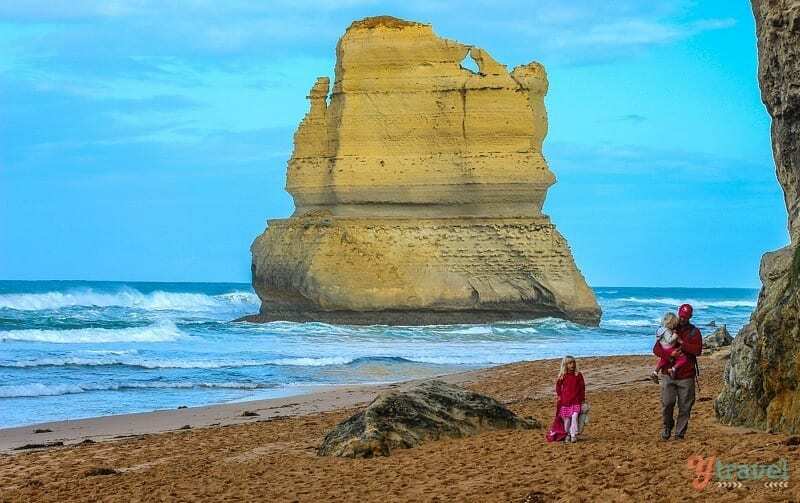 Obviously, you did not read the post properly as we clearly stated we hadn’t yet visited South Australia which is why the beaches were missing from the list. Loving all the attention WA is getting in this post!!! Might have to take a trip to Rottnest, it looks to die for! We just spent a year in Australia on a teaching exchange, and we were able to make many of these beaches. However we have many more to visit. Thanks for your recs. Great selection of Aussie beaches. It’s good to see a couple of Gold Coast beaches made the grade! The beaches at Cape Range Exmouth are pretty hard to beat but I would also add the beaches around Esperence in South East WA. They were pretty awesome. 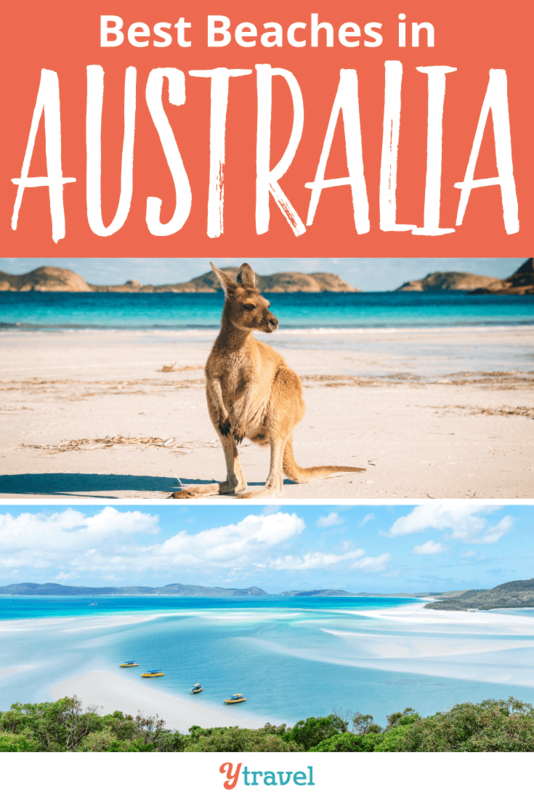 Awesome photos and locations – but I would add Rainbow Beach AND Double Island Point, QLD – home the the famous Coloured Sands and Carlo Sandblow. Where are your best South Australian Beaches!? 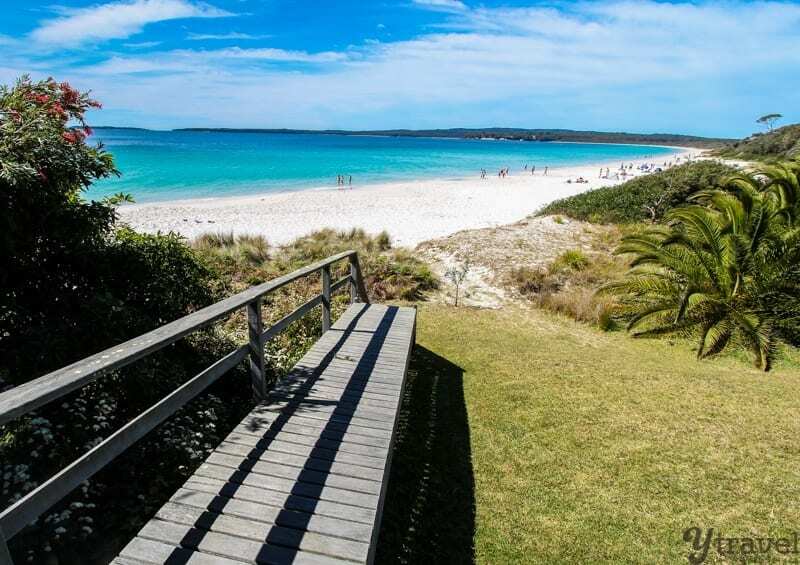 Very pleased to see that Bicheno Beach was on your list. 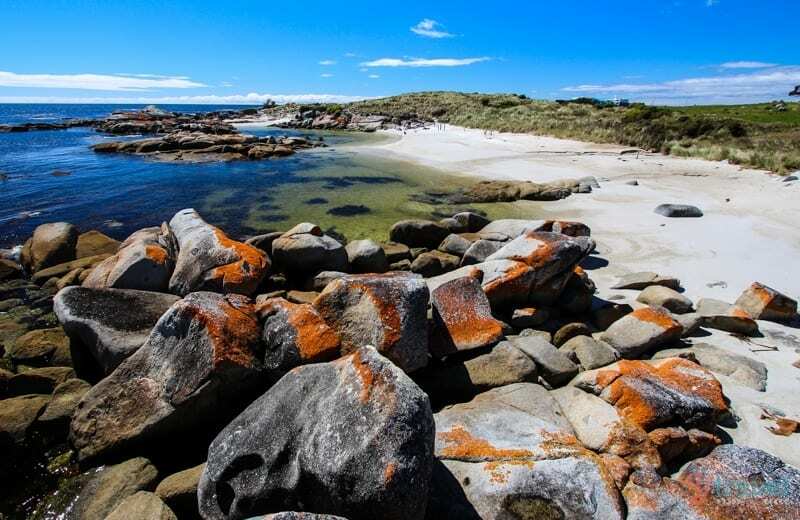 It’s one of my favourite places in the world (I know, big call) but I love Tasmania and Bicheno has it all with its wonderful little township, white sands and those extraordinary orange rocks and boulders – truly fantastic. Australia has over 11,000 beaches ! You haven’t even listed the best beaches in NSW — so how can you claim to have “38 of the best” in the country ? While the far South Coast of NSW has it all over anything found around Jervis Bay..
As for the Far North Coast/Northern Rivers region — you barely touched on what is actually up there ! Keep trying, though — maybe some day you will be lucky enough to experience some of the hidden gems around Newcastle, Port Stephens, Lake Macquarie and Gosford..
And you’re so upset because? It’s all opinion isn’t it. We’ve experienced a lot of the beaches in Australia, and in our opinion, these are what we feel is the best. Don’t waste your time and energy getting upset over our opinion. By all means, share what you think is great too and add to the list, but save yourself some upset about it. Well said David, Celito beach in Smith’s Lake comes to mind instantly!!! Great post. I am really amazed you visited and took photos of all of them. Most of similar posts are more of a list with “borrowed” photos. Big kudos. PS I can’t really understand haters…they don’t even read the post and they start complaining about a missing state or a missing beach. The sense of beauty is so subjective. Just take this post and any similar one as a personal opinion…. Hmmm, did you even get near Cronulla, just south of Sydney? South Cronulla, North Cronulla, Alleura, The Alley, Wanda, and Green Hills beaches to start with. Then add Voo Doo, Boat Harbour, and ALL the Kurnell beaches. Oh! did I mention, the little known and secluded Blackwoods beach? Or Shelly, Oak Park and ‘Bass and Flinders’? Perhaps I didn’t. Then there is the jewel in Cronulla’s crown, Salmon Haul Bay! Why go anywhere else? But wait there’s more. Darook Park beach, and the nudist beach around the corner. Gunnamatta Bay beach just north of that. Then a short ferry ride on the Port Hacking to Bundeena gives you Bundeena beach, Mayian Bar beach and sand spit, the little known nudist beach at Jibbon point, and most incredibly, the nicest little secluded and protected beach of all, Jibbon beach itself. You have to get out more and come see. Oh, and did I mention, Swallow Rock? Hi Garth, thanks for your suggestions. Sounds like some nice beaches in that area. With over 10,000 beaches in Australia it’s hard to see them all personally. Hi Craig, I apologise if I sounded a little condescending in my tone, but I am continually amazed at how many people I meet for hear of that travel to see Sydney beaches and MISS THE BEST ONES! People hardly know of Cronulla and it world class beaches in it’s surrounding areas. Yes I am biased, but I have travelled extensively and I can tell you my assessment of these beaches is substantially correct. Yet tourism NSW does little to promote this area well, or at all. You could easily cover a visit to all those beaches in one day and have often done so with friends and visitors. They re amazed at how close to Sydney they are and how accessible, yet so unknown. A trip to Sydney with looking some of them up is criminal! LOL. So next time you’re about here, look me up for a free tour. Don’t forget to look further afield in your travels and take David Laurie’s advice to seek out the northern beaches in NSW. Especially around the Forster/Tunncurry and south around Smith’s lake, Blue’s Beach, area. An absolutely stunning location. If you have a small boat or tinny You’ll be assaulted by the endless options of beaches in the region. See an aerial over view of that part of the country to understand the size of the problem. Cheers . G.
No worries. We do have more beaches in Oz than probably any other country worth visiting. And most people only fly into Sydney for 2-3 days so tend to stick to the obvious. As mentioned in my blog post I’ve only listed beaches I’ve personally visited and there are many in each state that could be added to my list I’m sure. Cheers. Thank you for all your wonderful suggestions. We haven’t explored that way so couldn’t put any on the list. We’re keen to check them out now! 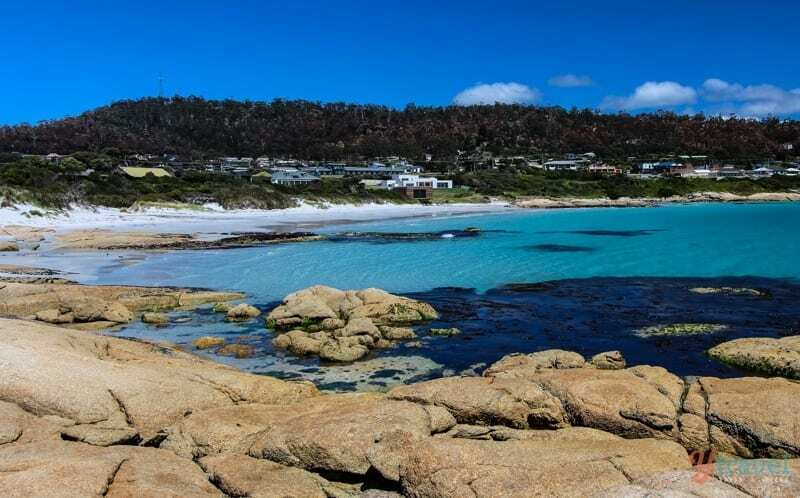 I have only visited Western Australia, but the Beaches around Albany, a beautiful harbor town are stunning, Little Beach and Two Peoples Bay are spectacular. My favorite may have been Green Pools and Elephant Rock between Walpole and Denmark, a must see. bring the snorkel gear and sneakers to walk the beautiful rock formations. Hi there Craig, this post is just awesome. Now I exactly know where to go in Australia… it’s just going to take more time 🙂 to visit all those wonderful beaches, but I think I can manage it. You missed all the stunning coastline of Newcastle and the Central Coast! Some absolute beauties there. Merewether has an amazing beach, with baths for swimming in, Catherine Hill Bay has great swimming, surfing and diving, Terrigal is a great spot for families with swimming, surfing and the rock pools. If you haven’t been to any of these beaches yet, you should! The Nelson Bay Area shouldn’t be forgotten either! Stunning beaches and some great walks. A great list! I’m surprised Bulcock Beach isn’t listed on here. My fav beaches and scenery r on kangaroo island. We spent one week there and wished we did two weeks instead. Island is very untouched, isolated, raw natural beauty. When there, also check out the koala bear night walk, rapture bird show (wild birds, they r not captured), incredible rocks at flinders park, and views at seal beach. For swimming, best beach were Stokes beach and the beach that my rental wood cabin was located on (I forget name but it is near flinders park and near the koala night walk,) which this beach also had wild kangaroos and a very secluded safe beach with no waves. We stayed on east and west coast of island and preferred the west, but suggest staying on both sides so the drive is shorter if u plan to c the whole island (half and half). Driving speed is slow cuz it is dirt road and lots of wallibies so u don’t want to hit them and no street lights. From your list, I know u would enjoy kangaroo island (very pricy but worth every penny).